Welcome to Aranda & Aranda DDS PA in San Antonio, Texas! Dr. Rafael Aranda and Dr. Martha Aranda are dedicated to providing you and your family with outstanding comprehensive dental care. Together with our knowledgeable dental team, our dentists focus on pediatric dentistry to help your children maintain healthy, bright smiles. At Aranda & Aranda DDS PA, we are committed to staying up to date with the latest in dental technology, and we are proud to utilize digital X-rays, intraoral cameras, and ZOOM!® teeth whitening at our dental offices in San Antonio. Your health and happiness are our top priorities, and we concentrate on meeting all of your dental needs and goals. Our gentle and friendly dentists and dental team are sure to be able to put your child at ease and help them have a relaxed, pleasant dental experience. Parents are always allowed in the back treatment room with their children. To help all of our patients feel comfortable and calm, we offer conscious sedation dentistry, with nitrous oxide available in our dental office and general anesthesia provided at an outpatient facility. We also have English-, Spanish-, Russian-, and Farsi-speaking staff members to meet all of your family’s needs. 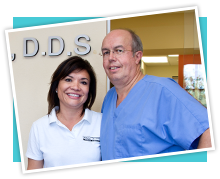 For over twenty-two years, Dr. Rafael and Dr. Martha Aranda have been proud to serve San Antonio, Texas and the surrounding areas of New Braunfels, Seguin, Live Oak, Edgewood, Leon Valley, South San Antonio, and Stone Oak with high-quality pediatric and family dentistry. We invite you to browse our website and call our dental offices to learn more about our dental treatments, our dental team, and our dentists, and to schedule your appointment. We look forward to caring for you and your family! © Copyright 2019 Rafael Aranda. All Rights Reserved.